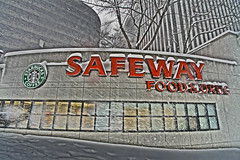 This morning at 6am, the Southwest Waterfront Safeway opened for official business and marks the first time the neighborhood has had a real grocery store in months. Residents enjoyed a “sneak preview” yesterday from 4pm-8pm and the store was packed with people, music, and samples. This is pretty great, but the old store hasn’t been closed for “months”. The old store closed on April 6, although for about 2 weeks before that they had been selling off the remaining inventory.